At 02.20 early Sunday morning, 7th April 2013, there was a shocking robbery at the Shree Hindu Temple and Community Centre. A white, stocky, bearded man entered the building through the kitchen window. Man is described as wearing Sandy coloured chinos and a bluish and grey coat. He rampaged through the building damaging and breaking doors. Upon reaching the Main Office he destroyed the fire alarm using a fire extinguisher and kicked open the office door. He spent hours inside the temple, while the alarm was still ringing. He ransacked the kitchen and office, leaving behind blood stains throughout the building. 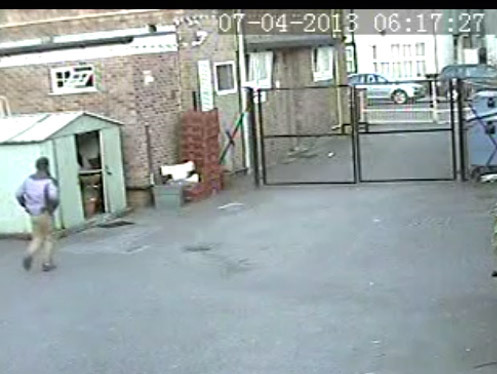 He left the temple premises around 06:17, after escaping through the firedoors and jumping over the fence. He was seen calmly walking off towards the Uppingham Road. He escaped with substantial amount of cash and caused several thousand pounds worth of damage to the Temple premises. He’s been captured on (Mandir) Temple CCTV systems and the police has been provided with footage. A forensic team arrived on scene on Sunday morning and collected evidence, including footprint, fingerprints and blood samples of the suspect. This is very sad to see that some people will do anything for money, they have no shame in robbing even a place of worship. We encourage all charitable organisations and residents to be alert. If you have any information about this robber then please contact the Leicester Police. 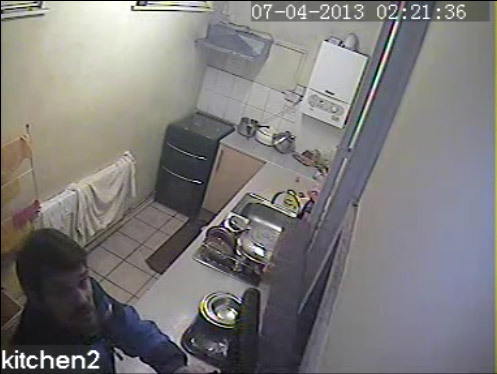 Here are CCTV pictures of the suspect.